The famous watch manufacture Arnold & Son has developed a great novelty Time Pyramid, which is a combination of technical skill and incomparable elegance. To create caliber A & S1615, which are equipped with clock, inspired by masters of the mechanisms established by John and Roger Arnold more than 200 years ago, and the old British skeleton clocks. Like all models in the collection Instrument, new Time Pyramid is also equipped with the same characteristics: the original design of the dial with off-center hour and minute hands, open housing, through which you can monitor the work of all the complications. A & S1615 mechanism created in a unique format – the balance caliber placed with tags “12 hours”, and in the position of “6:00” – two spring drum. 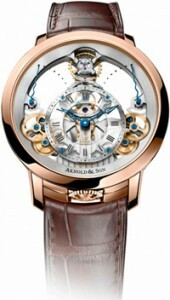 Mechanism is provided with 80-hour power reserve. Bridges are designed in such a way that the gear, two spring drum trigger and balance visible through the dial. All parts of the fire on the three levels – second dial – on the bottom, the middle – sapphire dial with indication of time, and at the top – a silver ring with the minutes. Asymmetry news highlights crown, located at the labels 6. New Time Pyramid presented in a circular housing with a diameter 44.6 mm in 18-carat pink gold. The front side of the case and case back protected domed sapphire crystal with coating. Water resistant up to 30 meters. Supplied model on a leather strap.